Le Comptoir du Vin dazzles in Station North. A restaurant’s menu can be minimalist without being simple. Proof of this can be found in Station North, where the charming new European-style bistro Le Comptoir du Vin has been impressing sophisticated diners since it opened in November. Generally, just seven to 10 dishes are scrawled in white chalk on a blackboard in the tiny dining room, but each of them offers a gateway to the best attributes of French-inspired cuisine. Take for example a relatively mundane-sounding bowl of lentils. Here, chef and coowner Will Mester demonstrates the depth of his skill. 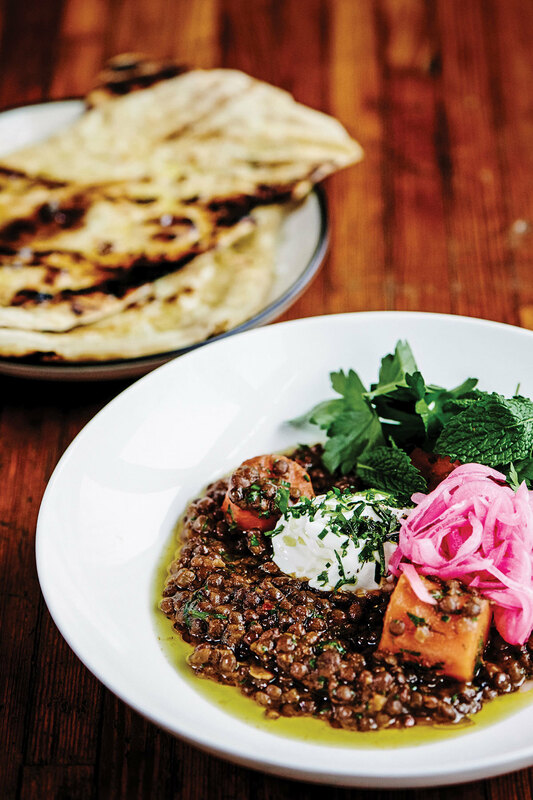 When combined with vadouvan, a French spice that is a derivative of masala, and labneh, a thick Greek yogurt that has been strained to remove most of its whey, the dish sparkles. Bread is a key component of any European meal, and the soft, lightly charred grilled flatbread paired perfectly with the concoction. It’s terrific, but it’s not even the best bread in the place. Mester’s girlfriend, coowner Rosemary Liss, calls pastry chef Kelsey Martin their “secret weapon.” She won’t be a secret for long. Her wheat sourdough, made with spelt and red wheat flour, is the kind of bread that makes even the thought of succumbing to a low-carb diet preposterous. It’s served warm, slightly crisp, and topped with Japanese katsuobushi butter. Two thick pieces accompanied an outstanding order of pork pâté. We assume most people smear it on the bread, but each slice was so tasty on its own that we savored them individually. Mester and Liss met three years ago while working at Bottega, the revered neo-Italian restaurant that occupied Le Comptoir du Vin’s space until it moved a block away in 2017. His Baltimore culinary journey includes stops at Woodberry Kitchen and the late Parts & Labor. She did fermentation and tended bar at Clavel. They’d been looking for the right location to open their own restaurant for nearly two years when the Maryland Avenue venue became available. Co-owners Will Mester and Rosemary Liss met three years ago while working at Bottega. Mester and Liss have spent time in Osaka (where his mother is from), Tokyo, and Kyoto, so Japanese flavors play a large role at Le Comptoir du Vin as well. Orion, a light lager from Okinawa, was the only beer selection on the nights we were there. When it comes to libations, here, too, Mester and Liss are judicious but nuanced with their selections. Two reds, two whites, and one skin-contact wine were available by the glass, with six others sold by the bottle only (most are French). Sake, Campari, whiskey and ginger ale, and gin and tonic were also available. During our first meal, we drank Côtes du Rhône, which paired well with our pici pasta and swordfish served with large corona beans and salsa verde. The pici pasta, essentially fat spaghetti, was served with duck ragout and olives and was complex and well executed. In keeping with European sensibilities, both entrees were on the smaller side, but appropriately priced at $16 and $18 respectively. That left plenty of room (in our stomachs and our wallets) for a slice of Martin’s signature Japanese yuzu cheesecake, which managed to be rich and light at the same time. The star of our second dinneralong with that sourdough breadwas the steak tartare. Masterfully seasoned and topped with a raw egg yolk, it was accompanied by decadent potatoes simmered in water and then fried in duck fat and tossed with the classic herb-parsley mix persillade. 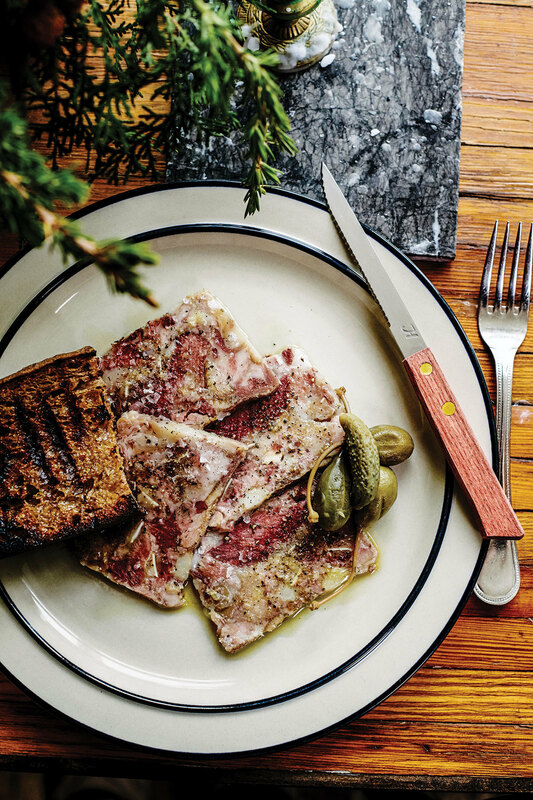 The menu will change on a seasonal, weekly, and even daily basis, Mester and Liss say, but stalwarts such as the sourdough (and steak tartare, we hope) aren’t going anywhere. Opening their own restaurant has been a whirlwind, the couple says. The key, according to Mester, is “finding a balance between work and the rest of your life. It’s a lot, but when it’s yours, it’s really gratifying and exciting.” They’re serving outstanding, worldly food in a lovely, warm space—and they’re still doing it together. What more could we ask for? That’s simply magnifique. LE COMPTOIR DU VIN 1729 Maryland Ave., 443-297-7384. HOURS: Tues.-Sat. 5:30-10 p.m. PRICES: $8-18. AMBIANCE: Casual.